Located in the Navsari district of the state of Gujarat, Vansda National Park got established as a National park in the year of 1979. The park got named after Maharaja of Vansda who privately owned the area. Interestingly, some parts of the park are dark even during daytime. That is because it has a supremely dense plant growth. And during monsoon, since there’s heavy rainfall, it just adds to the already abundant park. 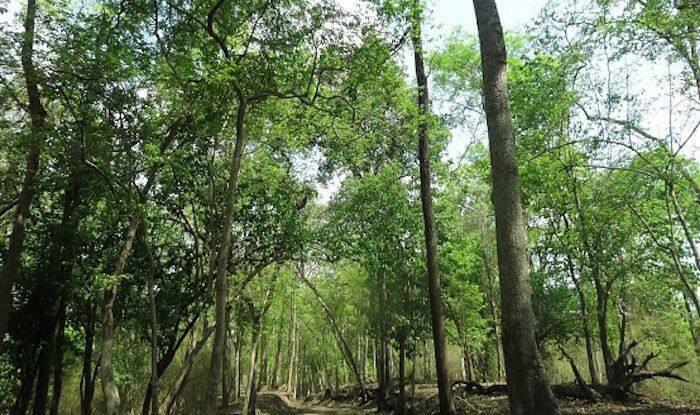 The vegetation includes 440 species of plants out of which the most prominent ones are the moist and dry deciduous forest cover, bamboos, tall teak trees, orchids, mango groves and gigantic creepers. The surrounding landscape is breath-taking as well: the beautiful river Ambika flows through the north eastern boundary of the park, small streams here and there, beautiful rolling hills and sweeping valleys. The park also has a fairly large number of tribes living in and around such as the Bhil, Gamit, Warli, Kokni, Kunbi and Dangi tribes. National parks are areas that strictly stand for the betterment of wildlife and biodiversity; where developmental activities, forestry, poaching, and hunting are not permitted. And at Vansda, they’re proud of providing a safe habitat for the diverse flora and fauna. You’ll find an abundance of reptiles like python, Russell’s viper, cobras and kraits in the well-maintained Ambika catchment area. The area also abounds in colourful and delicate orchids that are a treat to the eye. The park terrain might remind you of the northern and western limits of the Western Ghats in India. The wildlife too is varied here: you may spot everything from leopard, rhesus macaque, giant squirrel, wild boar, hanuman langur, common palm civet, Indian porcupine, four-horned antelope, barking deer, hyena, jungle cat, to even flying squirrel. It’s also a birder’s delight with resident and migratory birds found here in large numbers. You’re likely to spot the Indian woodpecker, yellow back sunbird, pompadour pigeon, malabar trogon, common grey hornbill, jungle babbler, forest spotted owlet and paradise flycatcher among others. You could club your visit with the nearby Waghai Botanical Garden; taking a nature education trail from there up to the National Park is a delightful experience for the nature lovers. The nearest airport is the Surat airport, about 120km from Vansda National Park.